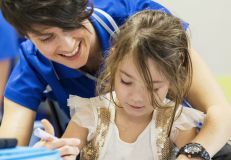 AEIOU Foundation for Children with Autism is one of Australia's largest providers of full-time early intervention, delivering a curriculum that is underpinned by evidence-based practices. 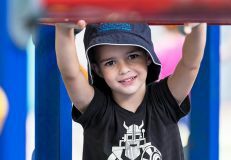 With nine centres across Queensland, including Nathan, Logan, Bray Park, Camira, Sippy Downs, Gold Coast, Bundaberg Toowoomba, and Townsville, and one in Brighton, South Australia, AEIOU Foundation supports more than 240 pre-school aged children with an autism diagnosis each year, in a naturalistic setting. If you have a child with an autism diagnosis who is aged between 2 and 6 years, or if you care for a child with autism, talk to us today about how we can help. AEIOU’s therapy-based program is full-time, providing 20 hours of intensive early intervention each week. Families also benefit from access to specialist long-day care outside of the program times. Centres are open from 7am to 5pm daily, although this may alter slightly in regional areas. Each AEIOU Foundation centre is staffed by a transdisciplinary team of program managers, behaviour therapists, occupational therapists, speech and language pathologists, early childhood teachers and skilled facilitators. All staff are skilled in the delivery of autism-specific therapy, and support children to achieve individual goals. We also employ a research and psychology team. Find out more about our curriculum, and our fee structure today. Contact our centres directly here.